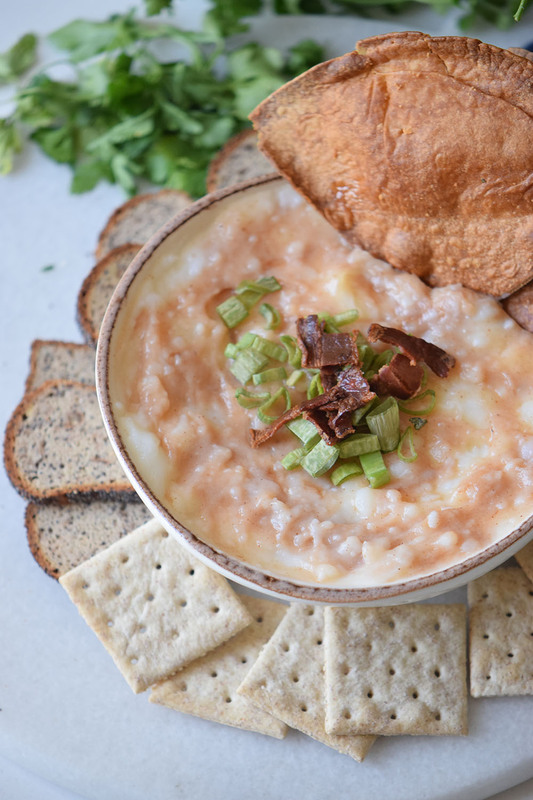 I believe that every guy should master 3 recipes: A great steak, an ice cold cocktail and a crowd favorite dip. Even if you don’t like to cook or don’t find yourself often in the kitchen, those 3 recipes are all you need for date nights, game watching parties and get-togethers with friends. 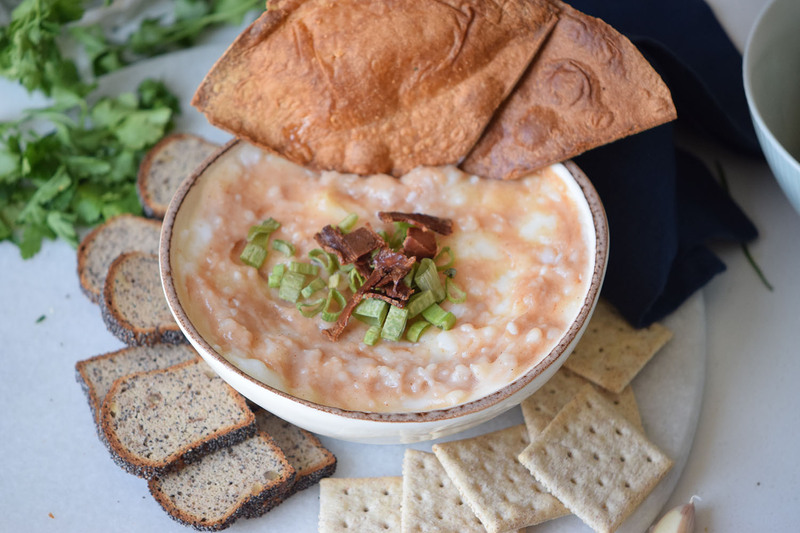 This BBQ Chicken Dip is the dip recipe that I find myself making again and again. 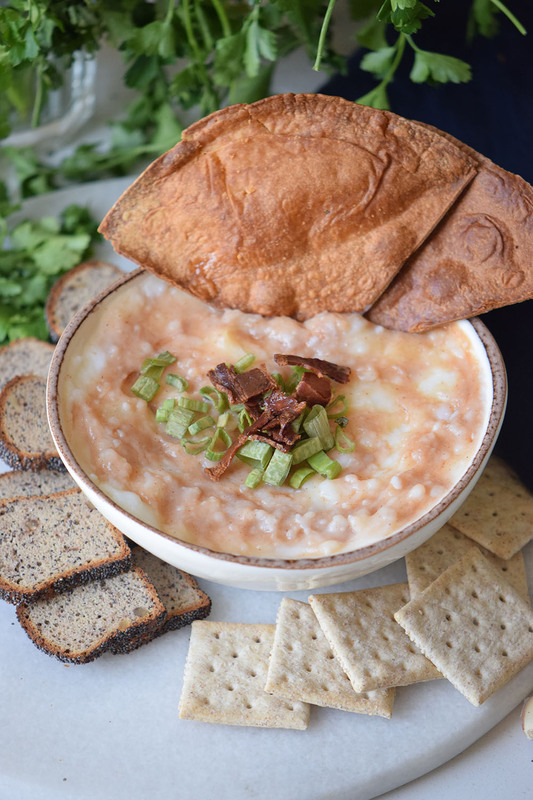 To say that is delicious is a huge understatement, this recipe is packed with flavor, is creamy and has all the things a good dip recipe should have: flavor, thick and spreadable consistency and that easy to make factor that in my opinion is a must. 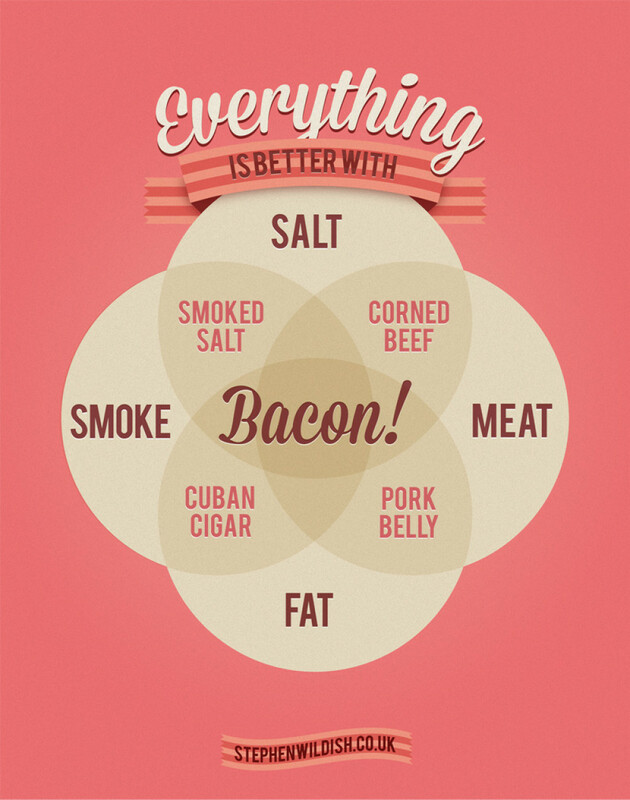 Also, you don’t need a lot of ingredients to make it, but rather a couple of tried and true favorites that should already be staples in your fridge like chicken breasts, bacon, BBQ sauce, cream cheese, shredded cheese, onion and salt and pepper + some green onions to decorate and add another punch of flavor. That’s all you need. 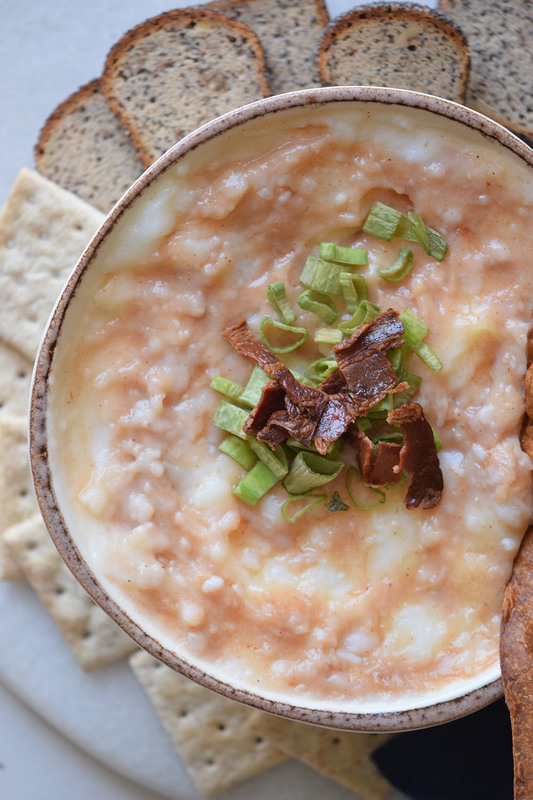 The other great thing that this BBQ Chicken Dip has is that you can make it ahead of time. Usually, I prefer to plan ahead so for me an appetizer that can be made ahead is a must for any party or gathering that I’m organizing, after all, I don’t want to be thinking about it before everyone arrives. The other great thing? You can serve it with anything and everything! 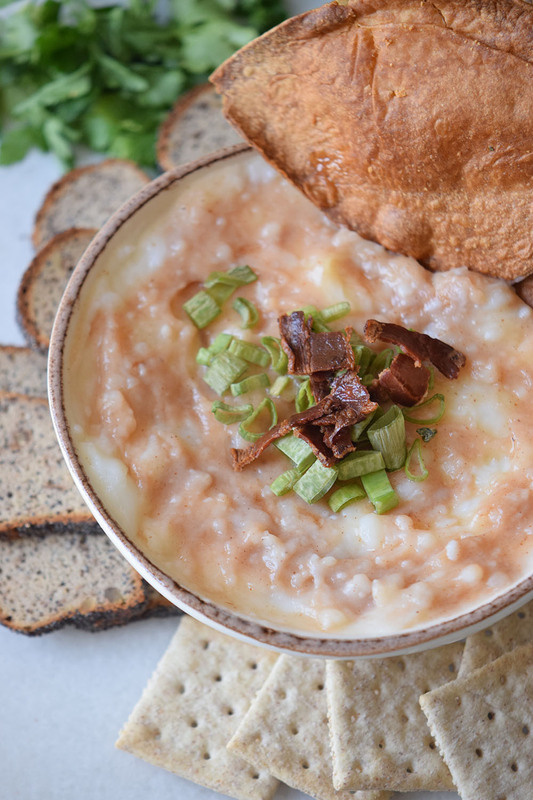 This dip is so versatile that it goes great with nachos, bread, vegetables, and even toasted tortillas. Don’t worry a lot about what to serve it with because it will only be a vehicle to transport it. When you have a dip this good you don’t need to worry about anything else. In a skillet over medium heat, cook the chicken for 8 minutes each side or until golden. Transfer to a cutting board and cut it into small pieces, set aside. Optional: soften the cream cheese taking it to the microwave for a couple of seconds. In a bowl, mix the cream cheese, white American cheese, BBQ sauce, salt, and pepper. Transfer to a serving bowl and garnish with green onions and some bacon. Optional: Cover and take to the fridge for up to 3 days. Bacon and beer are probably two of the best things you can have, seriously they should be considered pantry staples in every home. Actually, I’m pretty sure those are the only two things I need to cook anything that’s delicious. 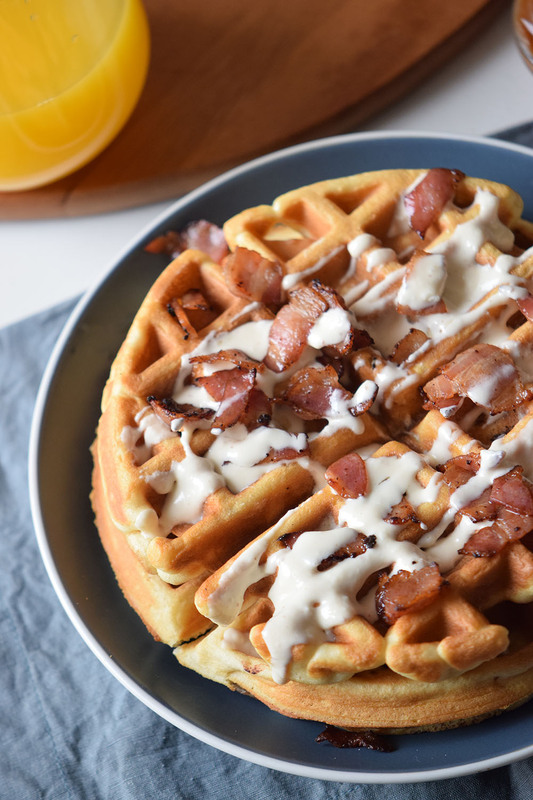 So when I was thinking about a perfect breakfast that combined my two passions the option was pretty clear: Bacon and Beer Waffles Recipe. Seriously , if you are not a fan of cooking and are only going to make one thing in your life, pick this one. 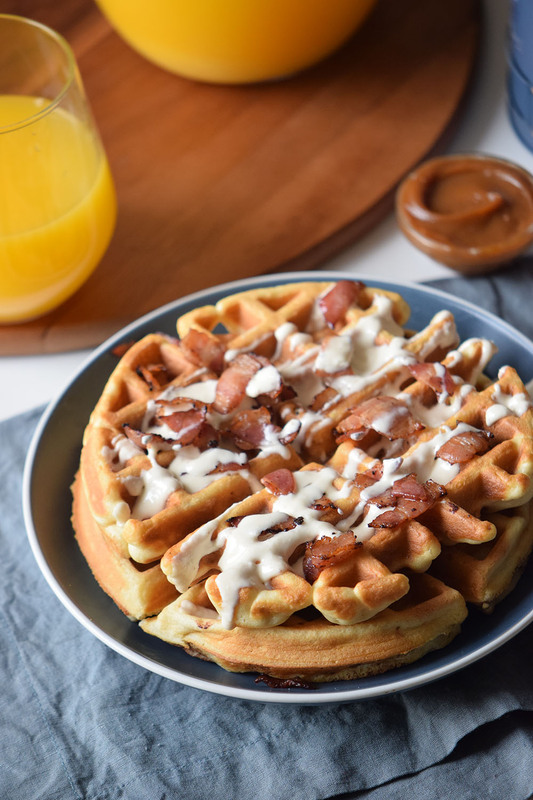 Bacon and beer waffles are not only great for breakfast, but they are also a great dinner option (breakfast for dinner could pretty much be considered the best thing) and also if you are feeling like it, even for lunch. 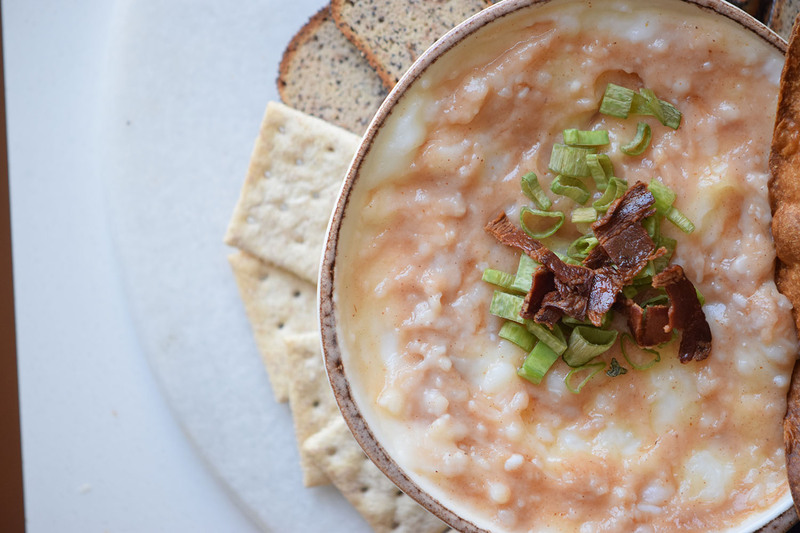 So you can basically have this recipe in your back pocket and make it for every meal. Another great thing besides the fact they taste awesome? They are really easy to make. I’m going to be honest with you, when it comes to making breakfast I want the easiest thing. After all I’m half asleep, half away and probably hungry, the last thing in my mind is cooking up a five dishes breakfast with complicated ingredients. 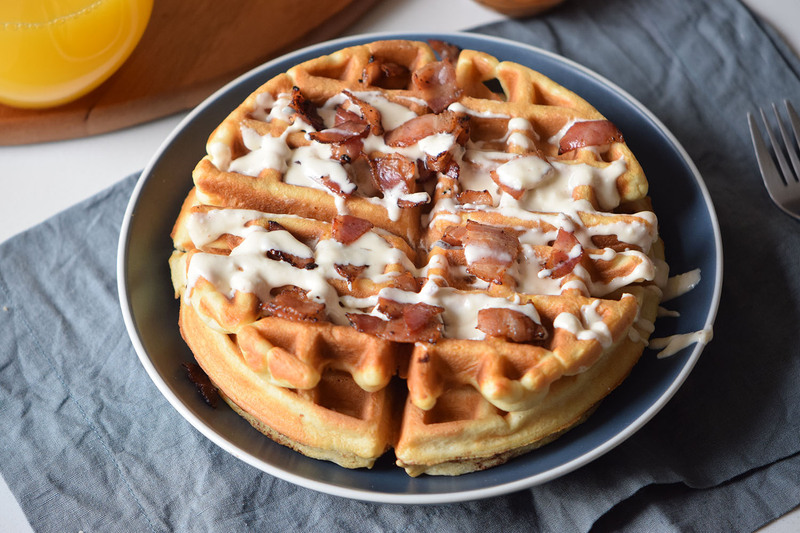 The bacon and beer waffles? They are quick and easy, and use things that you probably already have in your pantry. And since we are using a waffle maker you don’t even need to flip them like if you were making pancakes, seriously friend, when I say easy I really mean it. 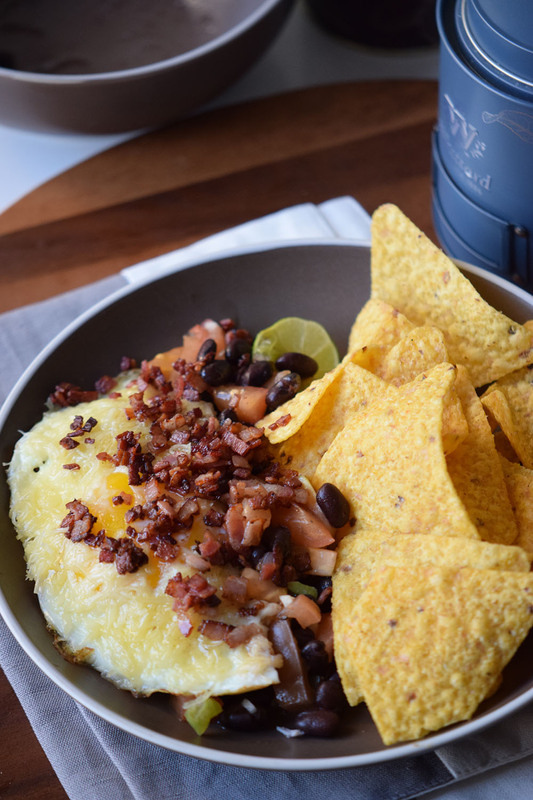 And once they are done you can serve them by themselves, with some whipped cream topping maybe or even with a drizzle of maple syrup (maple + bacon is a great flavor combo as well) or you know, if you are feeling extra hungry with more bacon and a huge side of bacon huevos rancheros. Mix the flour, milk, half the beer, butter, sugar, egg, salt, half the bacon, and baking powder. Stir until the mixture becomes thick. Pour into the waffle maker. 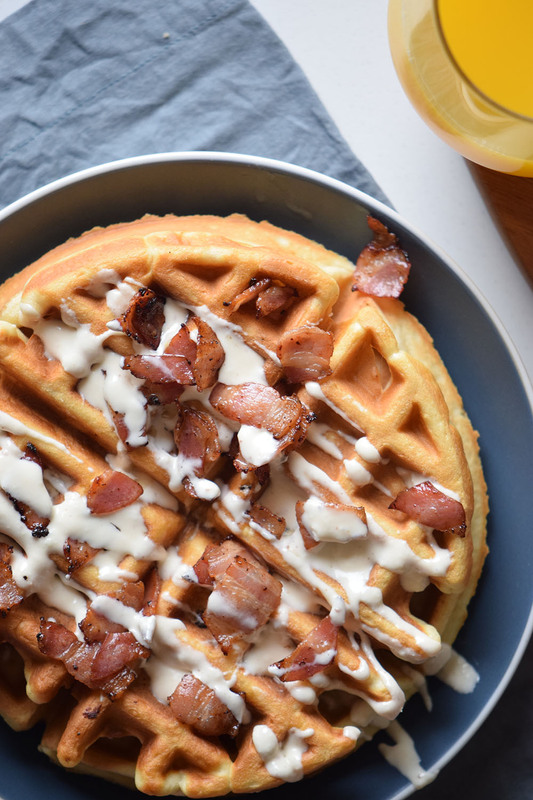 Stir together the remaining beer and whipped cream, and drizzle it over the waffles. It’s Summer, it’s hot outside, the grills are sizzling and the days are perfect to be outdoors by the lake, by the grill or camping, which means that’s the perfect moment to eat ice cream. 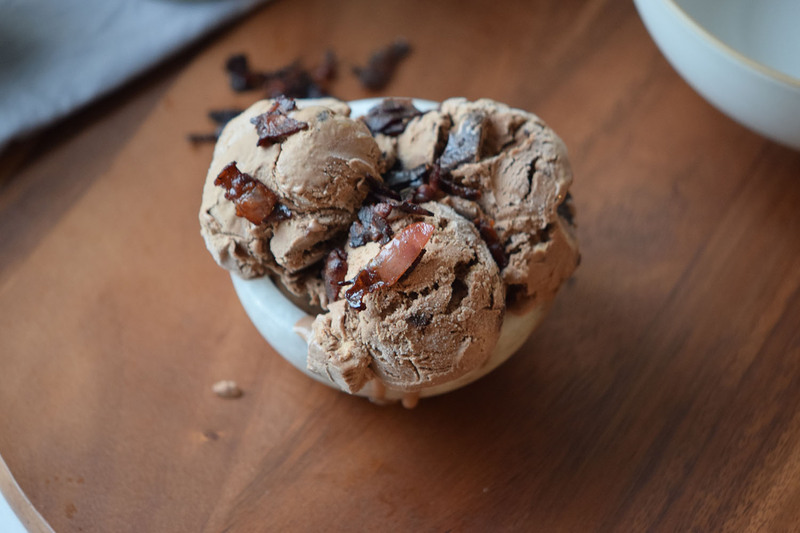 Specifically this bacon chocolate ice cream recipe. I know I know, bacon in the ice cream is probably one of my craziest ideas so far. But I’m on a pursuit to include it in each meal, including dessert and this is the best way to do so. The combo is not crazy, quite the opposite is pretty good! If you have had a maple bacon donut then you probably already know that the sweet salty combo is GOOD, in this case, we also have the creamy crunchy one that takes things to a whole new (bacon) level. And then we also have the chocolate because chocolate makes everything better. So creamy, crunchy, salty, sweet and with a chocolate punch? Count me in pal! 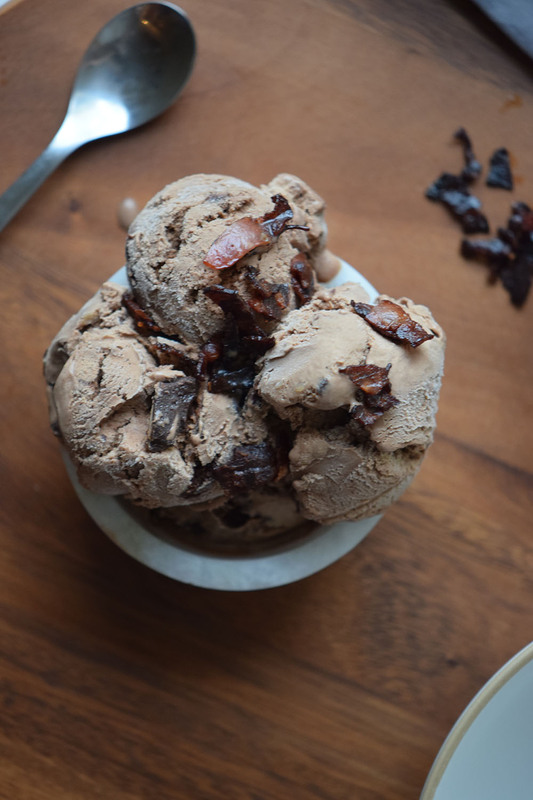 But to eat bacon chocolate ice cream you have to actually make it, which can seem like the most difficult thing on the planet. Except that is not. It’s easy, really easy. 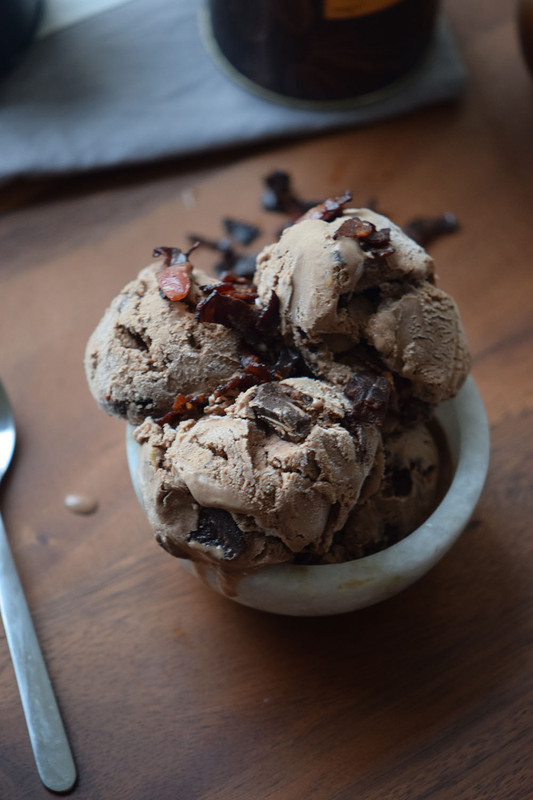 You just need a couple of easy to find ingredients, really crunchy bacon bits (the crunchier the better is how the saying goes) and an ice cream maker. Just mix everything, pour into the machine and let it do it’s own thing while you sit bag and watch a game, go out to throw some balls or start the BBQ process. 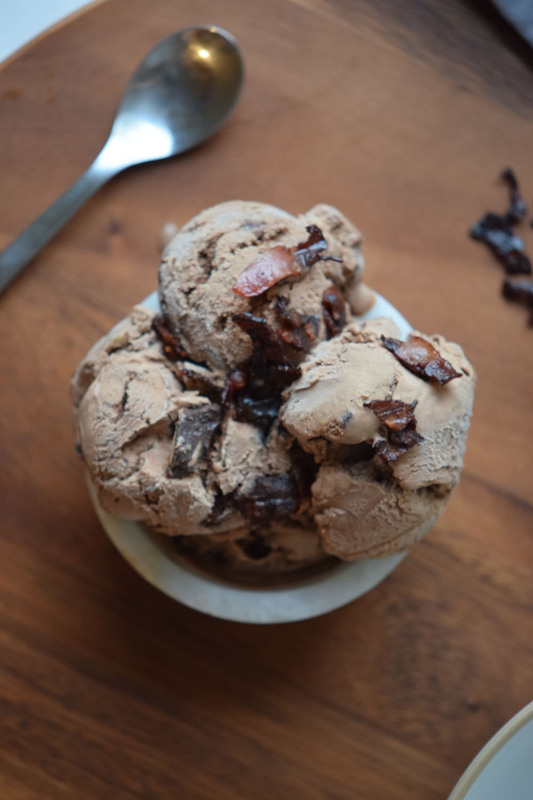 Once the ice cream make ends up the cycle (it can take as little as 30 minutes if you have a good machine) serve the ice cream in a bowl and top it off with more bacon bits because there’s not such a thing as too much bacon. 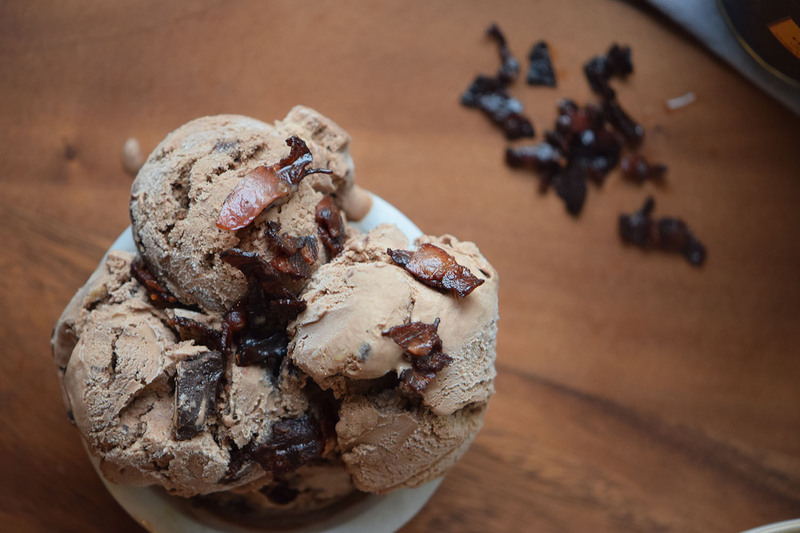 This Bacon Chocolate Ice Cream Recipe is sure to please. In a bowl mix the milk, heavy cream, sugar, cacao and the egg yolk. Slowly pour in the melted chocolate, add half of the bacon bits and keep mixing until everything is well incorporated. Pour into the ice cream maker and churn according to directions. Scoop into bowls and top with the remaining bacon bits. 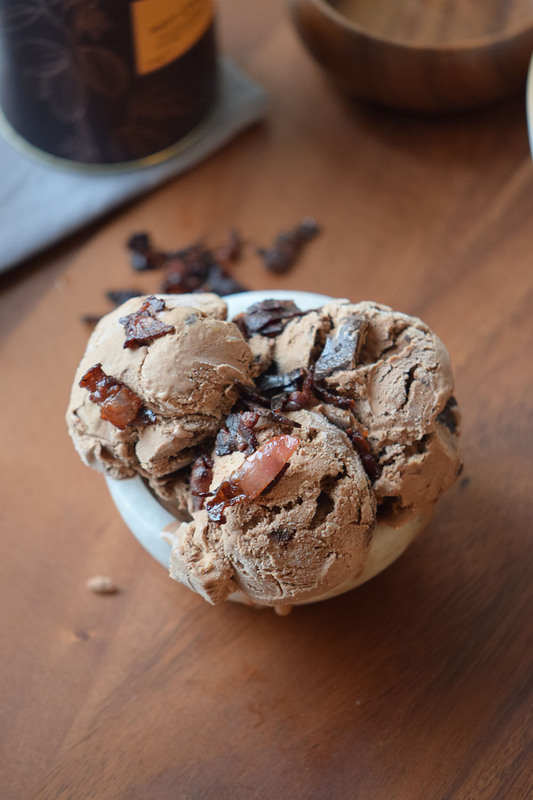 Enjoy this Bacon Chocolate Ice Cream Recipe and let us know what you think! 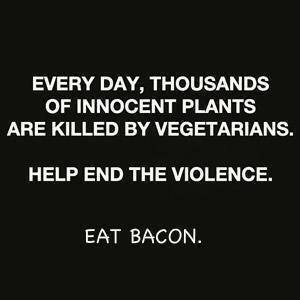 If you’ve been a reader around here for a while then you probably already know that I could eat bacon for every meal. Yes, just like my sidebar says I’m powered by bacon badassery all day every day. 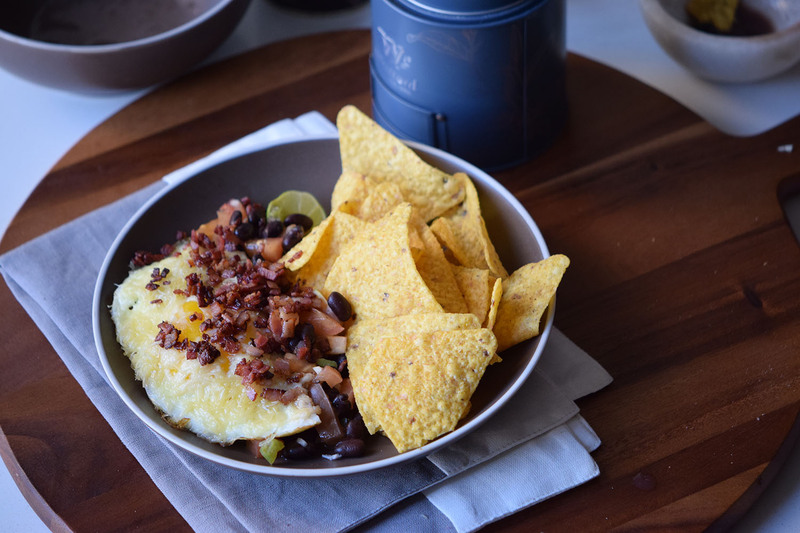 So obviously when I make breakfast, I add bacon to it, enter these bacon huevos rancheros that you should make right now. This is one of those heavy recipes that’s especially good after you spent a night out or if you want to fuel up for a packed day. This is full of cheese, bacon, with just a hint of spiciness and served with a generous side of chips I mean that pretty much makes it the best breakfast in the world if you ask me. The recipe is really simple as well, is one of those recipes that pretty much consists of throwing everything into a pan and waiting for it to works its magic. The ingredients? 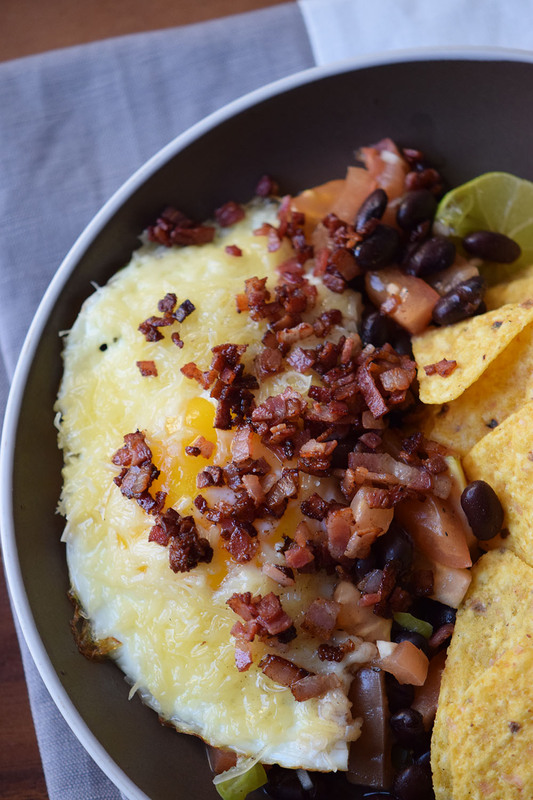 Diced tomatoes, jalapeños (this is Mexican, after all), beans, eggs, cheese and bacon. Let’s be honest, you probably have all that in your kitchen already. Then it’s just a matter of placing the tomatoes, jalapeños, beans, and cheese in a pan. While they are cooking fry a couple of eggs and the bacon and then just mix everything up. However, you need to keep one thing in mind, the bacon is the spotlight of this dish, so make a good one. Cut a couple of bacon strips really small, you want them to be everywhere on your bacon huevos rancheros and not only in a couple of spots, so the tinier the better. Then place in a pan and cook over medium heat until they are sizzling and look crunchy. Crunchy is the way to go here. Pair with a side of chips and you are done. Fry the bacon in a pan over medium heat until crispy. While waiting, fry the eggs in a pan over medium heat. In a separate pan or skillet place the tomatoes, jalapeños, beans, and cheese and cook over medium heat for 5 minutes. 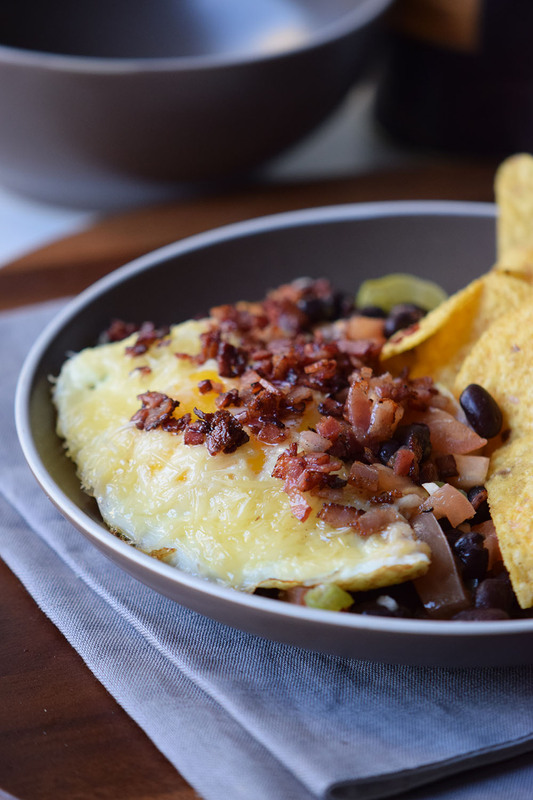 In a dish serve the tomato and beans mix, place the eggs on top, and top with the crispy bacon. 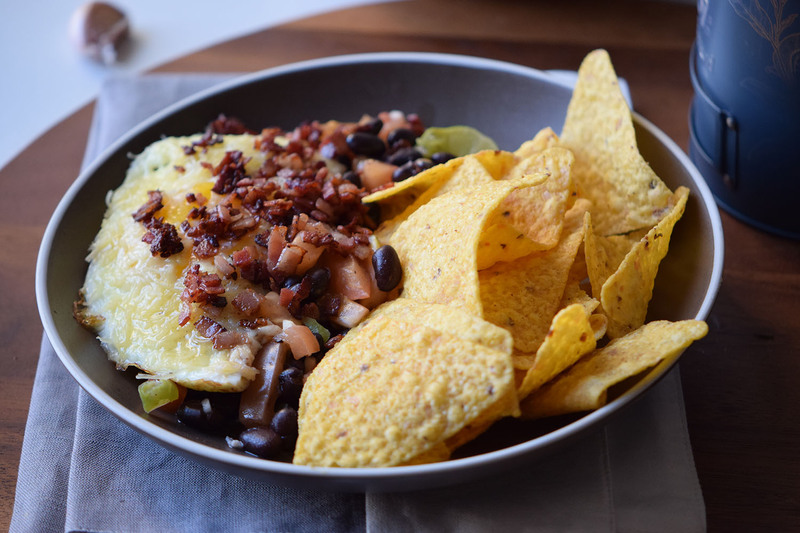 Serve with chips and enjoy this Bacon Huevos Rancheros Recipe. You had to know that this one was coming. 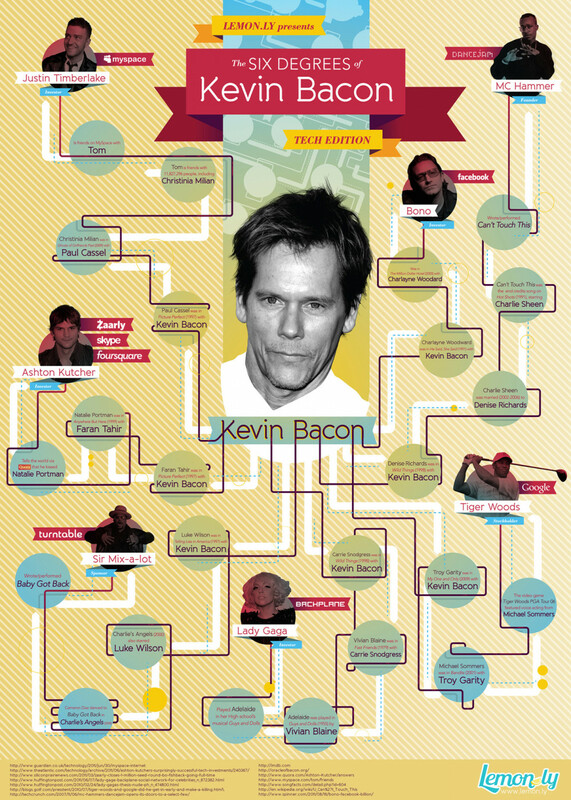 If you are not singing Footloose whiled dancing like Kevin Bacon in your head right now, you are crazy. And dead to me. Because even I watch what I am eating during the holidays. I usually just brush the crap off I don’t want to eat but I might try this during the holidays. More proof for my father in law. Happy Birthday, Monty. Bacon is on me. Do your part to end the violence. Sister in laws birthday today. She likes bacon too.